DAP is still serving a seriously sweet mac (even though it raised the price a buck to $6 during happy hour) with a blend of four cheeses, including Face Rock Monterey Jack, plus caramelized onions, jalapeños, and breadcrumbs, and it pairs perfectly with a beer and a seat looking onto SE Grand. Gooey cheddar and bleu cheese-based macaroni topped with house-cured bacon, shallot, and -- for an extra $1-- homemade kimchi. Hell, you can even get some fried chicken on it if you want! 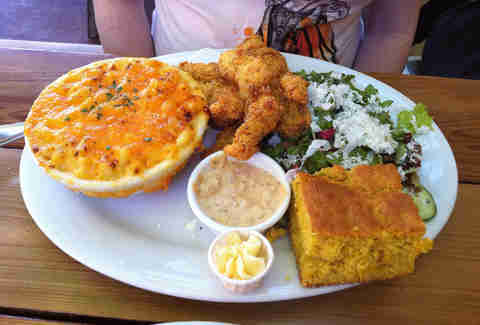 The thick crust is expertly designed to trap heat while maintaining a crispy exterior, which means you can concentrate on all but sucking the marrow from SD's excellent fried chicken until you're ready for the exemplary rendition of Southern-style mac & cheese. 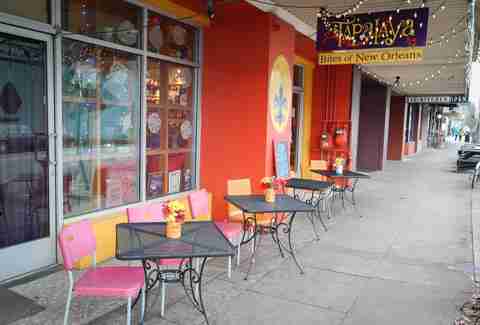 This popular neighborhood hangout is good at more than just burgers. 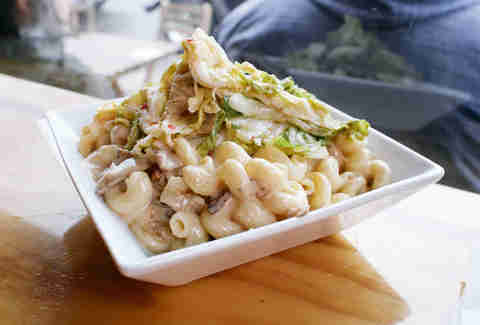 Its Roasted Garlic Mac & Cheese is a secret favorite (oops, not any more) in NoPo and even comes with a small side salad to make you feel like you’re eating healthy. 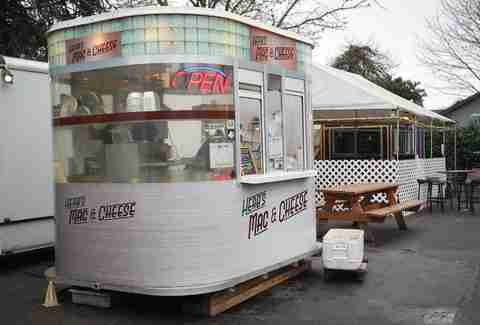 This spiffed up food cart in the Good Food Here pod off of Belmont is made to look like a '50s diner, and it has been serving some of the city’s best macaroni & cheese for almost four years now. 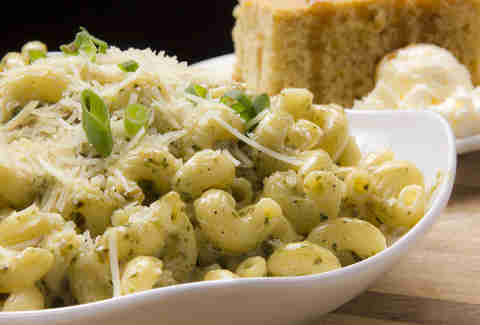 All macs start with penne in its secret cheese blend and begin at $5 for regular or $7 for double. After that go hog wild on various meat, vegetable, and cheese toppings. 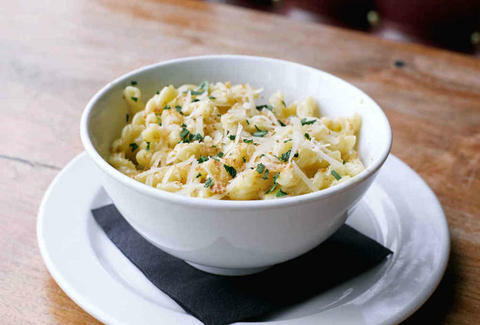 This simple but elegant homage to the golden age of Hollywood may have recently lost its charming bartender, but the cocktail program remains intact, and so does the absurdly affordable happy hour food menu and its filling, no nonsense $7 mac & cheese -- a hearty bowl of velvety noodles that never disappoints. 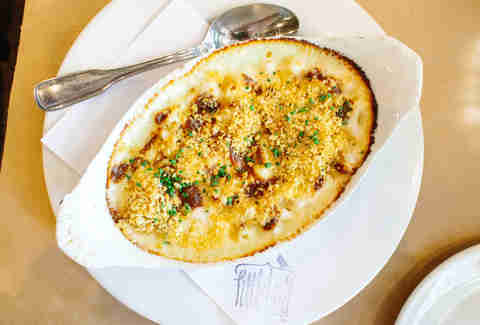 Okay, so Gabriel Rucker’s Downtown French bistro calls it Macaroni Gratin, but we know what it really is. And sure, it’s got a three cheese blend of Tillamook white cheddar, Emmi Gruyère, and whatever chef’s in the mood for, but we also know that it’s going to be delicious. Haven’t you had the burger? This contemporary Cajun and Creole restaurant has recently found success under new Executive Chef Anh Luu, who’s bringing a Vietnamese palette to the bayou. 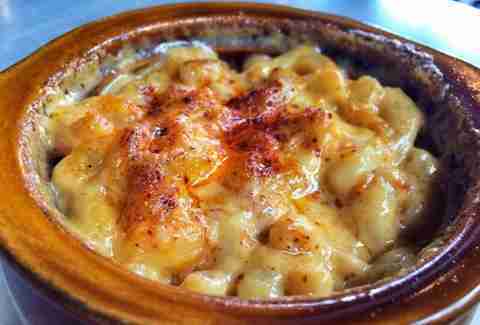 Most of the changes have been subtle tweaks, but there’s certainly something special about the blue crab-stuffed, baked mac & cheese. Miss Delta’s Trashy Mac can be done three ways: meatloaf, gumbo, or creole sauce stewed tomatoes and okra with chicken & pesto. And at only eight bucks during happy hour, there’s no reason not to bring some friends and try them all. 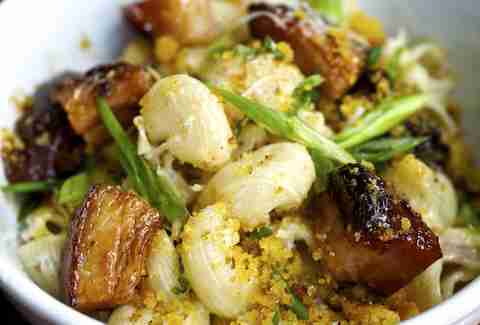 If one of our favorite pork belly dishes is mac & cheese you better believe it’s going to find its way onto this list. Grassa’s handmade pasta comes with a sweet barbecue pork belly, jalapeños, and crispy cornbread crumbs. 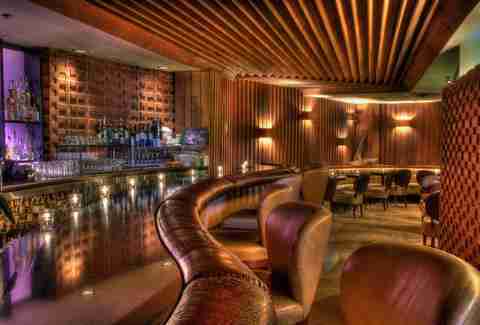 It was a divisive decision to leave this off of our last round-up. Most of y’all jumped into the comments to tell us how stupid we were but, at the time, Montage’s game was slipping. We’re happy to report that its back to its old self again.